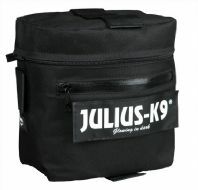 This is the Julius K9 Harness and backpack set. The Original Julius Harness were mostly used by professional dog handlers, police, fire and rescue dog units, but now days they are used also by everyday dog owners. 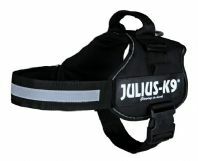 The material of the K9 harness : impregnated, scratchproof outer layer - breathing active inner lining with strong load distributing - sturdy seams and additional components - The handle on the back of the harness enables easy holding or lifting of the dog - The abdominal strap has a plastic handle and a chest strap with Velcro fastening - The reflective stripe provides excellent visibility, with the side holder which allows to attach more than 400 different yellow and reflective labels and name tags. K9 Harness: Closable handle - ÖKO-TEX inner lining - Reflective edge - Reflective chest strap - Seat belt material - Side bag mountings - Lamp holder - Luminous Julius-K9 logo - Heavy duty buckle - Inox steel ø 6mm - Ability to Add Saddle bags, change the velcro name tags/logo's or add a Chest pad or Y strap.